Ideal as a special gift for family and friends. 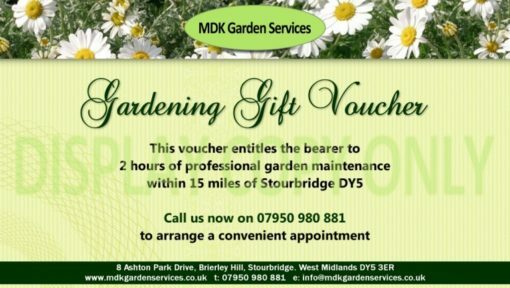 Gardening Gift Vouchers for 2, 3, 4 or 6 hours of garden maintenance includes all aspects of soft landscaping such as lawn mowing, weeding, hedge trimming, potting plants, planting schemes, garden design, edging, garden clearance. We are showing a display copy only, purchased voucher will be laminated with unique number and pressed flower. Ideal as a special gift for your family member or friend. Voucher must be redeemed in a single visit and valid for 12 months from purchase. The service is offered within a radius of 15 miles from DY5 (Stourbridge, West Midlands).